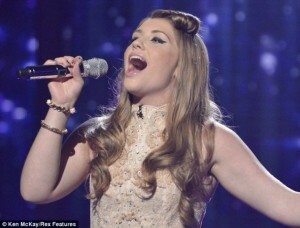 The very beautiful young lady, Ella Henderson, from last year’s X Factor, has unveiled her new single entitled ‘Waiting’. The song is exquisite, her melodic voice echoes against the piano accompaniment. It’s a very beautiful, and raw performance, and I would urge people to give it a listen. Listen to her new song HERE. Laura Whitmore, New Style Queen! My current style crush is Laura Whitmore, the presenter of ITV 2’s, ‘I’m A Celebrity Get Me Out Of Here Now!’. Whitmore came to fame in Ireland when she battled other contestants to become the face of MTV News in a ‘Pick Me MTV’ campaign. Since her first break into television she has gone from strength to strength and has even hosted a programme with Keith Lemon at the Brit Awards in 2012. With all this success comes the many, many, invites to press functions, premieres, award ceremonies, charity balls, the list is endless, and I for one am excited to see what Whitmore will be wearing. She has such an amazing sense of style and seems to look good in everything. After Bend It Like Beckham she had a whole host of successful films, , The Pirates Of The Caribbean franchise, as well as films such as , Love Actually, Atonement, King Arthur, Domino, The Edge Of Love and The Duchess to name just a few. She also has played my favourite character in literature, Elizabeth Bennet, in Pride and Prejudice. She has proved herself an accomplished actress, and has such a wide portfolio of work. Her success doesn’t end there though, oh no. She has had a high profile modeling career and her Chanel adverts have become iconic, and are the epitome of glamour and sophistication. She’s come a long way from football boots and goals! Myleene Klass, Such A Lady! Is it just me or is Myleene Klass, looking more beautiful as the years go on? Her advert for Littlewoods where she dons a bikini , just shows how amazing her figure is. In fact it rivals her iconic white bikini moment on I’m A Celebrity, four years, and more importantly two children, previously! Kylie, The Ultimate Pop Princess! Kylie Minogue, the Australian sensation, picked up another award to add to her collection, on Saturday 13th April, at the Logo TV NextNowNext Awards in Los Angeles. This time she received a ‘Dance Floor Hero Award’, which is to, ‘honour Kylie’s immortal standing in the eyes of the LGBT community.’ As she picked up the award, she made her way to the stage in a very lively manner, just proving she still has it! Zoe Saldana Looked Seriously Hot On The MTV Movie Awards Red Carpet! Zoe Saldana, the Avatar actress, looked absolutely beautiful at the MTV Movie Awards held at the Sony Pictures Studios on April 14th in Los Angeles. Saldana was there to present an award along with Chris Pine and Zachary Quinto. ‘The Devil Wears Prada’, star Emily Blunt, is currently one of my favourite actresses! I first saw Blunt in her iconic role as Emily Charlton, in The Devil Wears Prada, which she performed so superbly! It was quite clear that she was destined for great things. The role of Emily Charlton, in The Devil Wears Prada gained Blunt, six nominations for ‘Best Actress In A Supporting Role’. She went on to win one of those at the London Film Critics Circle Awards! Personally, I would have thought she would have gained more recognition for such an awesome performance, but sadly that was not the case. However, Blunt has won a Golden Globe for ‘Best Performance by an Actress in a Supporting Role in a Series, Mini-Series or Motion Picture Made for Television’ for her role in Gideon’s Daughter in 2005. Alesha Dixon Radiates On New Season Of Britian's Got Talent! Alesha Dixon former Mis-Teeq band member, to solo artist, to Strictly Come Dancing Champion, to dancing judge, to model and finally to Britian’s Got Talent judge, and breath! I don’t know about Britain having talent but Alesha Dixon certainly does! Katie's, 'Beautiful Ball', Full Of Beautiful People, For A Beautiful Cause!